The Mission of Custom Jiu Jitsu is to provide an atmosphere of honor, humility, and hardwork in order to develop the leadership character and personal goals of youth and adults through the vehicle of BJJ. The Vision of Custom Jiu Jitsu is to see individuals' lives changed for the better, wherever they are on their journey, through the practical life lessons, traditional teachings, and supportive community of BJJ. What is Custom Jiu Jitsu? Rooted in Tradition. Tailored to the Individual. 1. "Custom: a practice so long established that it has the force of law." Basically, our Jiu Jitsu originates from the time tested, fundamental, traditional methods of the masters. 2. Custom also means that it is tailored specifically to the individual. In other words, there is no one size fits all Jiu Jitsu. Jiu Jitsu Evolves. However, there are most definitely fundamental principles that should be adhered to while training Jiu Jitsu. Nonetheless, we understand there are many different body types, personalities, and skill sets. We try our best to help you find your expression of Jiu Jitsu. "Journey: a traveling from one place to another, usually taking a rather long time." 'The Journey' simply means that we realize the Martial Art of Jiu Jitsu is a lifestyle more than a destination. It is a 'traveling' of sorts. A series of trials and errors, ups and downs, wins and lessons learned. We are not so much concerned with the outcome of the art (as in: are you winning trophies?) so much as the process of becoming a better person. The process of realizing your potential through vehicle of BJJ. We base our system on helping people achieve their personal Jiu Jitsu goals whatever they may be, wherever they are in life. Sometimes the journey is approached with a Winner or Loser mentality; both of those titles showcase a Performance ONLY Based mindset. They distract from the journey; from the process of becoming a better person through your chosen art. Likewise, arriving at a Win does not always mean you are growing in Character; in Honor & Humility. Granted, there is a place for competition, a place for performance, on the journey and we offer an avenue for those who wish to pursue that. However, our BASE is about the Journey of becoming better grapplers; better people. A Journey Based mindset allows the individual a chance to let go of outcomes and focus on the process. I come from a Performance Based mindset and this change from a Performance Based to a Journey Based is a direct result of meeting our affiliation founder: Nicolas Gregoriades. For this I am extremely grateful. He has made my journey MUCH better. Aside from the boy-hood fantasies of being a ninja, Randy’s martial arts journey started during his teen years where he learned the fundamentals of Danzen Ryu Ju Jitsu, Judo, and folk-style wrestling. In 2003 he started training Brazilian Jiu Jitsu and has not put it down since. His first introduction to the sport was from his friend, David Hattori, on board the USS Chosin CG-65. He then trained under Romolo Barros of Brazilian Freestyle Jiu-Jitsu in Honolulu, Hawaii. From there he moved to Eugene, Oregon and trained under Heitor Abrahao of Abrahao BJJ. Afterwards he moved back to Klamath Falls, Oregon and joined the Jiu Jitsu Brotherhood Association. In 2011 Randy stumbled across the Jiu Jitsu Brotherhood Website and devoured the principles and techniques covered in those pages. Coincidentally, around the same time, Nic Gregoriades was holding a seminar in Mendocino, California at a Grappler's Retreat event. Randy had the opportunity to sit in on one of Nic’s seminars, meet the man behind the Brotherhood, and has since valued the substantial ties a Journey Minded Approach to Jiu Jitsu fosters. 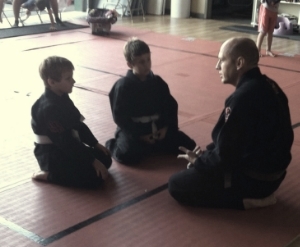 He is passionate about teaching BJJ and instilling value into all those he influences.